Why We're Happy this New Year! 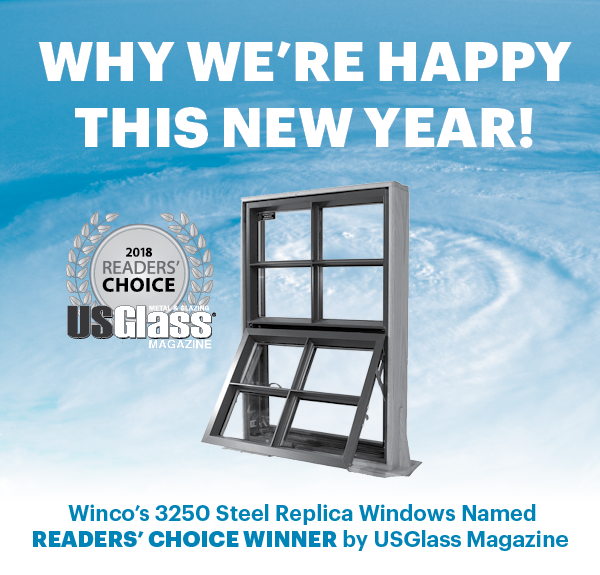 Thanks to the readers of USGlass Magazine, Winco was named a winner of the magazine's 2018 Readers' Choice Awards. Our new hurricane-rated 3250 Steel Replica Windows recieved the honors! Each year, USGlass asks their readers to vote for their top products in a variety of categories. Readers include some of our favorite people: architects, contractors, glazing professionals and building owners. We'd like to think our hurricane-rated windows have made quite an impact! Winco's 3250 Steel Replica Windows make replicating the historic look of buildings in coastal areas a breeze. Capable of withstanding up to 200-mph hurricane winds, Winco's 3250 Steel Replica Windows are hurricane-impact tested to meet AAMA Certification, as well as Missile E (9# 2x4 @ 80 fps) and Missile D (9# 2x4 @ 50 fps), ASTM E1886 / E1996 enhanced protection of wind zone 4 requirements for hurricane winds up to 90 psf design pressures, and blast-tested per ASTM F1642 to meet UFC requirements. With such a broad range of certifications, Winco is able to provide Steel Replica windows on any coastal water in the United States. Visit us at www.wincowindow.com to learn more.